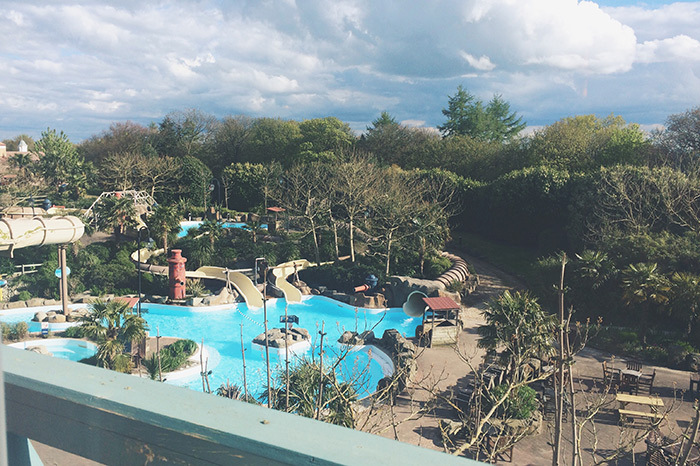 This time two weeks ago we were at Alton Towers, staying at the Splash Landings Hotel and I really wish we were still there as we had so much fun. I shared the news with you about how we were chosen as Konfidence Swimologists a few months ago and as part of the package we got to go and test out some of their kids swimwear products in the Alton Towers water park – you can read our review of the swimwear products here. I used to go to Alton Towers quite a lot when I was growing up so I’ve always felt quite attached to the place but I hadn’t been for about ten years so I was excited to see how it had changed during that time. 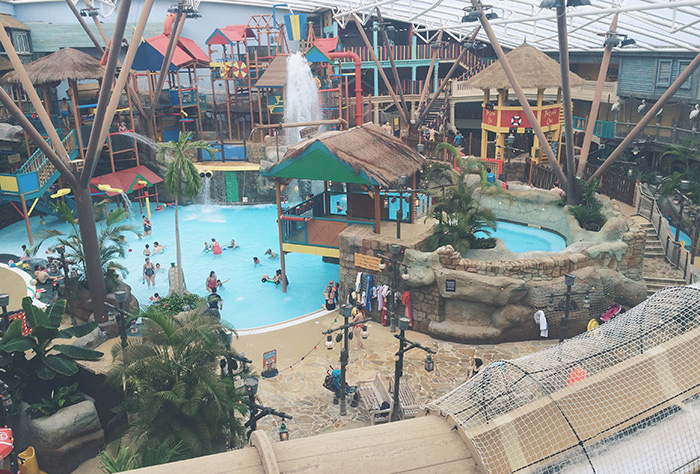 There weren’t any hotels when I was there last and nor was there the water park or CBeebies Land, an addition which has really transformed the place into somewhere that’s suitable for young children as well as older kids and adults. One of the things I love about Alton Towers is it’s location. It’s hidden in the middle of a big forest and the part of the drive is so picturesque. You go through the little village of Alton then up lots of hills with huge trees before turning off and driving into the middle of the estate. The water park is right in the middle of the Hotel which is also joined onto the main Alton Towers Hotel so you can walk between the two without going outside. All the windows in the centre look out to the water park, this means you can see it when in the bar / restaurant, how amazing does it look?! There is also an outdoor part to the water park which looks like this. This was our view from our room, it looks like it could be another country. As you can see the water park is huge, unfortunately it was too cold to go in the outdoor bit when we were there but I did try out the indoor flumes. One of which is fine for kids, you have a ring and they sit on top of the adult. I went down with Cherry and she loved it, you can see in the video at the bottom she is screaming out ‘this is the best day ever!!’. And the other one is for adults only (well people of a certain height anyway) and is pretty scary! I am a total wimp these days though, you go down on a ring and it sends you spinning backwards! As well as the two hotels there is also a log cabin village which has it’s own restaurant. With that one, the buffet style restaurant in the Splash Landings Hotel and the restaurant in the main hotel there are three places to eat. I would say here that it is essential to book, the lady did ask if we wanted to make a booking when we checked in and we said we would have a think and let her know but we totally forgot. By the time we went to eat they were all booked up for hours so we had to take a drive to the local supermarket to buy a picnic. The on-site restaurants are quite expensive so you can get a list of local pubs from reception. We were going to go to one but the kids were so tired that we knew it would be a bit stressful hence opting for a picnic! Once you have come out of the hotel or parked in the car park there is a monorail that takes you to the theme park entrance, it only takes a few minutes and saves a lot of walking. The actual theme park itself is one of my favourites, there is a huge castle in the middle as well as some gorgeous grounds with flowers. It’s so much more than just a theme park on some concrete. I am going to write about the rides and the best areas for kids in an upcoming post as it would make this post super long to add it in now. They had entertainment in the evenings as well as having lots of CBeebies ‘celebs’ walking around at various points throughout the day. We got to meet Postman Pat just as we were leaving. We went into the theme park on a Thursday during term-time and it was so quiet. There was hardly any queuing time for the rides, by the Friday it was a different story though and so much busier. We left at 3pm and didn’t get home until 9.30pm as the traffic was so bad on the motorway but we had an amazing time and can’t wait to go back again at some point. Thanks to Konfidence for sending us! Have you been to Alton Towers? What’s your favourite ride? !